Once the principles are demonstrated, a design specification can be prepared. 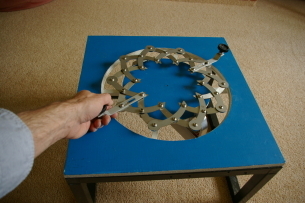 A custom manipulation device was required for folding over the edges of a circular product. After a variable radius device had been identified and validated on an instrumented test rig, CAD files for the eventual machine were produced to suit conventional and rapid protoytpe manufacturing techniques. With this design just two axis of control then were sufficient to move the 10 folding fingers in approriate 3 dimensional paths.